I made this card for a friend of my daughter. The party is later today, so I need to hurry! I'm entering it in the Sketch Saturday challenge. What? Today is only Sunday, how did I finish the card so fast?! It was mostly finished a couple days ago. I like to get all the bits and pieces together first, before I glue the whole thing together. So I fit everything to qualify for the challenge. 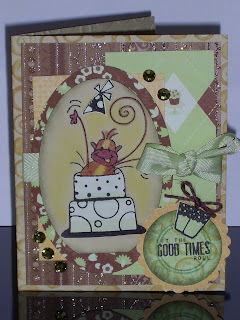 Fab card so much fun to it and I love the monkey, thanks for joining us on sketch saturday. 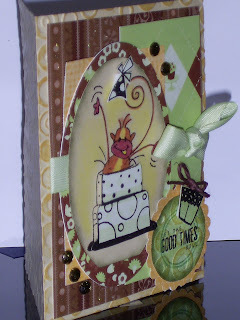 Card Making is my Addiction. Basic Grey , Charisma and Pollycraft Card.